The image by Victor Burton that's being used to promote 'Revealed' - 'Nyiirnkajarra' (man with nasal septum pierced), (2016). The annual Revealed Exhibition this weekend in Perth features works by more than 75 new and emerging WA Aboriginal artists from 23 art centres all over the state, showcasing the diverse and vibrant condition of contemporary Aboriginal art in the West. This community art event has been held since 2011. 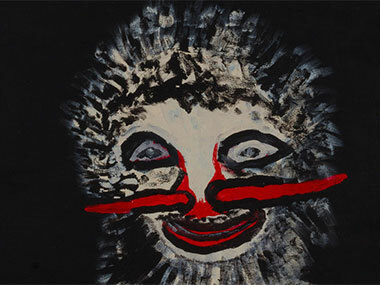 Featuring paintings, prints, wood carvings, photography, textiles, video, weaving and more, this enticing and sometimes surprising exhibition presents the work of artists from extremely remote areas alongside those from regional towns and metropolitan Perth. Language groups represented stretch from the Mirriwoong of Kununurra to the Worrorra of Mowanjum; and the Noongar of urban Perth and Fremantle across to SA for the Pitjanjatjara at Maruku beside Uluru. 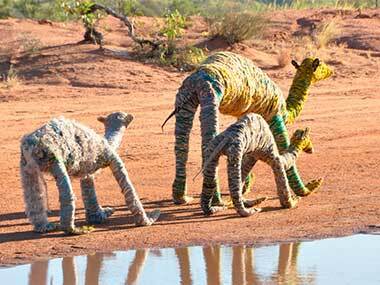 On the way there are virtually unknown art centres such as Cheeditha, Walkatjurra, Yarliyil and Tjukurba. Wonderful to see familiar artist surnames such as Cherel, Whyoulter, Mung and Ward representing the offspring of artists past from long-established centres such as Mangkaja, Martumuli, Warrmun and Kayili. At just 12 years old, Layne Dhu-Dickie is the youngest participant to feature in the 'Revealed' exhibition. His contribution is a drawing of superhero Captain Hedland, whom he came up with for his comic book of the same name. Captain Hedland is a social justice hero who fights crime and bad guys in the artist’s hometown of South Hedland. Also from the Spinifex Hill Art Centre in Port Hedland, Adina Newman’s glitter artworks will be featured at the exhibition as well. Centre manager, Greg Taylor said Newman’s work had quite a presence and made a big impression. “She incorporates glitter into her paintings, which depict the harsh landscape of the iron ore industry. 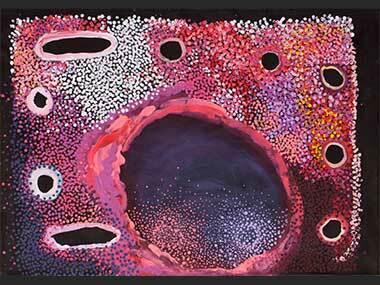 The exhibition is a great opportunity to give the four Spinifex Hill artists great exposure”. As well as the exhibition which runs until May at the Fremantle Arts Centre, there's an Art Market there on Saturday from 10 to 5 and a Forum on Friday from 10 to 12. Entitled 'Our Story, Your Story', it's a rare (if brief) chance to participate in Aboriginal artist-led conversations about the importance and diversity of art and culture with senior artists from communities across the State. These short, lively conversations may reveal new and unexpected insights into the ever-changing nature of Aboriginal cultural and artistic expression. The artists will discuss the new techniques and technologies being harnessed to produce textiles, fashion, experimental video, animation and preservation of language. Patrick & Winston Green, who are Ngaanyatjarra brothers from the desert Tjukurla community who make videos to share and reconnect with deep and powerful parts of their family’s country in the Western Desert. Leah Umbagai, the Manager of Mowanjum Art and Culture Centre. She's a rare tribal manager, from the Woddordda tribe in Dambimangaddee Country of The Kimberley. Leah will touch on the difficulties some Aboriginal people face living within two different worlds. Peter Farmer, born in Gnowangerup in the Great Southern, is a successful Noongar artist who works in many mediums and supports the development of Noongar Aboriginal fashion and art. Mervyn Street is a senior Gooniyandi man from the Fitzroy Crossing River Region, and an accomplished author, illustrator, carver and painter who has begun making animations as a way of engaging local youth. Mervyn will create a live sand animation on stage. Grace Lillian Lee is a Cairns-based fashion designer who works with Aboriginal communities to help translate art into fashion, and she'll show and discuss wearable items made in WA communities.